I do have a connection with Daugherty researcher with well documented records. I’ll share links and contact information here if I obtain approval. The James, William and Nancy are uncle/aunt to your John L, not brothers and sister. They are brothers and sister to the father of John L., John Dougherty that married Hannah Letcher. 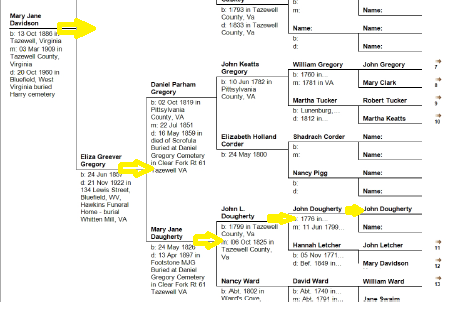 John that married Hannah Letcher; James that married ELizabeth Hamilton; William that married Ruth Towson and Nancy Ann that married Jacob Leese; were brothers and sister, having traveled from Strabane, Co. Tyrone, N/ Ireland prior to 1791 to Delaware, Maryland and ultimately into Virginia. 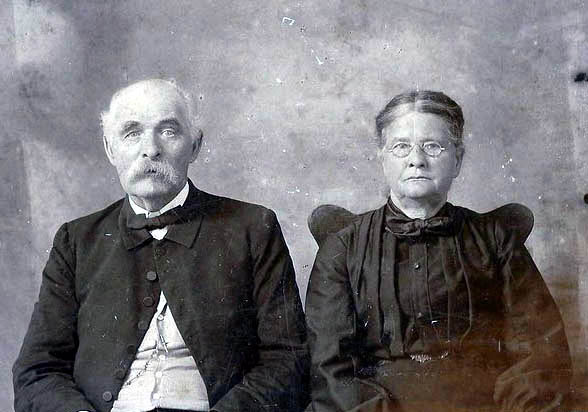 David A. Daugherty & Nancy L. (Moore) Daugherty are my 2nd great grand uncle and aunt. 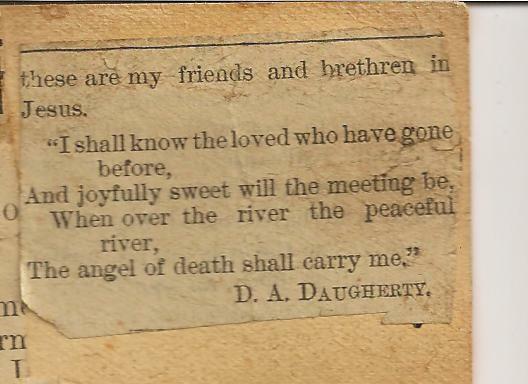 I uncovered some of my Daugherty connection in an old scrapbook of newspaper clippings obits, marriage announcements, calling cards etc. that belonged to my Grandmother Buckland. Fortunately, or by divine intervention it was preserved instead of being tossed into the trash. My dad (the railroader) kept the old scrapbook after his mother’s death in 1960, and I received it after he passed away in 1993. Above all, this is one of my most treasured possessions. 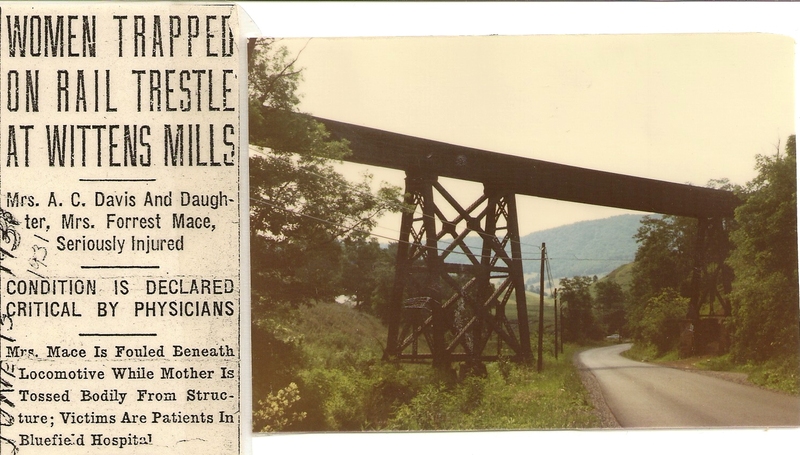 It would not have been of interest to most anyone else in the family, but it has opened the door to discovering my roots unknown to any living relatives. 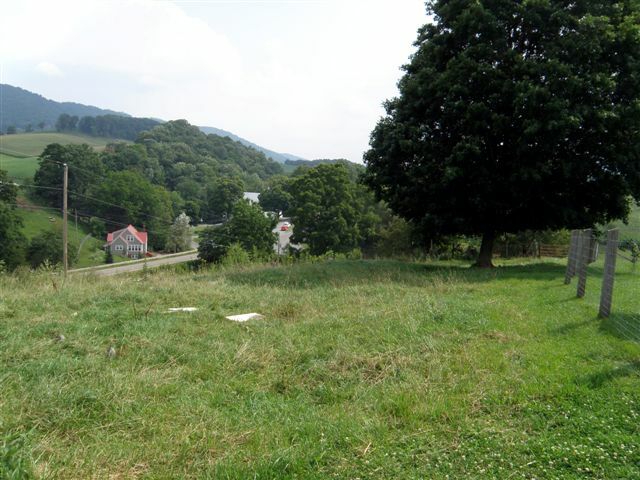 Dad and I tried to find the old Marrs Cemetery in Falls Mills, Virginia, but to no avail. However a good many years later, my two brothers agreed upon my insistence that we try again. And we succeeded. The once sacred ground was being used as a horse pasture and probably by now, the animals have nearly destroyed the headstones forever loosing placement of the community’s deceased. (a rant for another day). 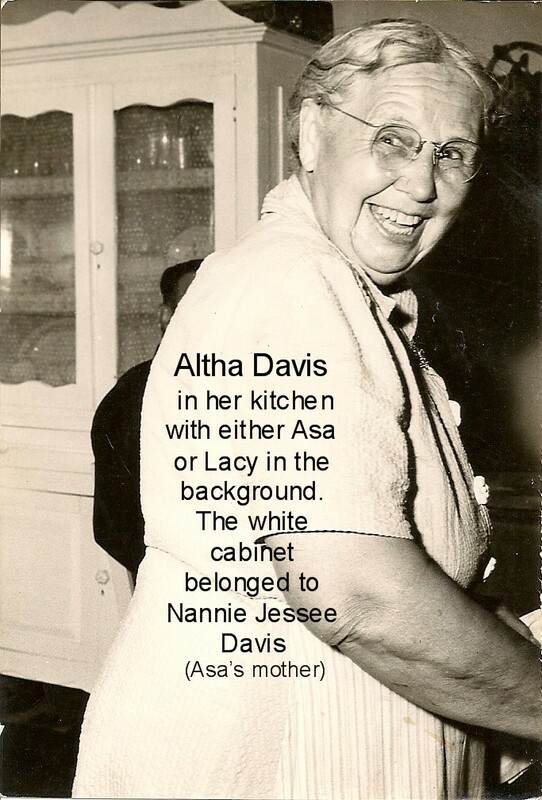 From a page of Mary Jane Davidson’s scrapbook below, we read her great uncle’s obit. Interestingly, there is an additional clue to another relative previously unknown, Virginia’s Civil War Governor, John Letcher. 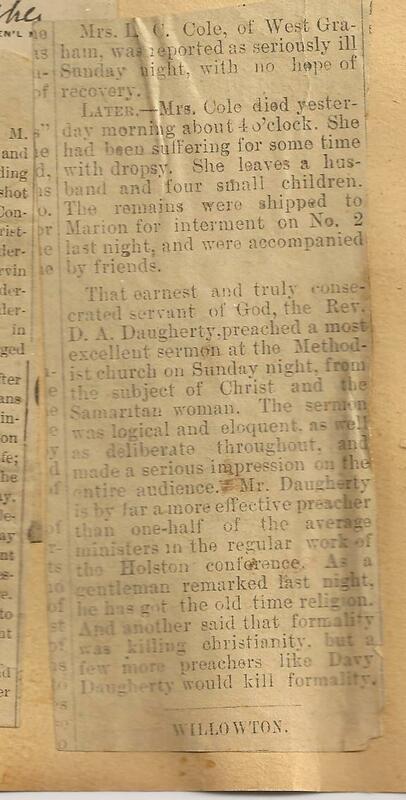 In Grandmother’s clipping below we read kind words apparently said by Reverend Daugherty proclaimed at the funeral of a dearly departed. 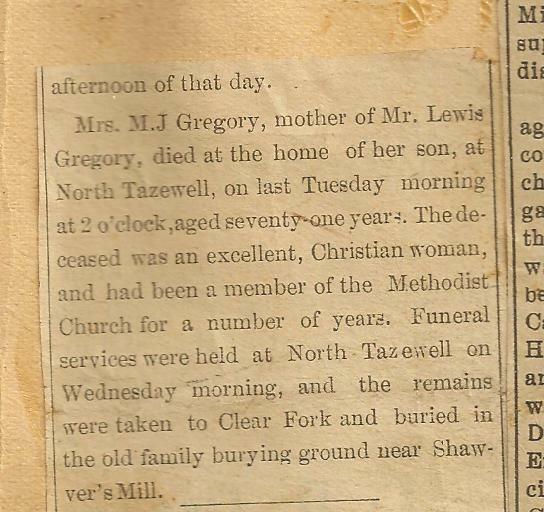 The precious glued papers of the book revealed the obit of Mrs. M.J. Gregory, grandmother to Mary Jane Davidson and for whom she was named. Mary Jane Gregory (Daugherty) 1826-1897) was David Daugherty’s sister, both children of John L. Daugherty (1799-1868) and Nancy Ward (b. abt. 1802). 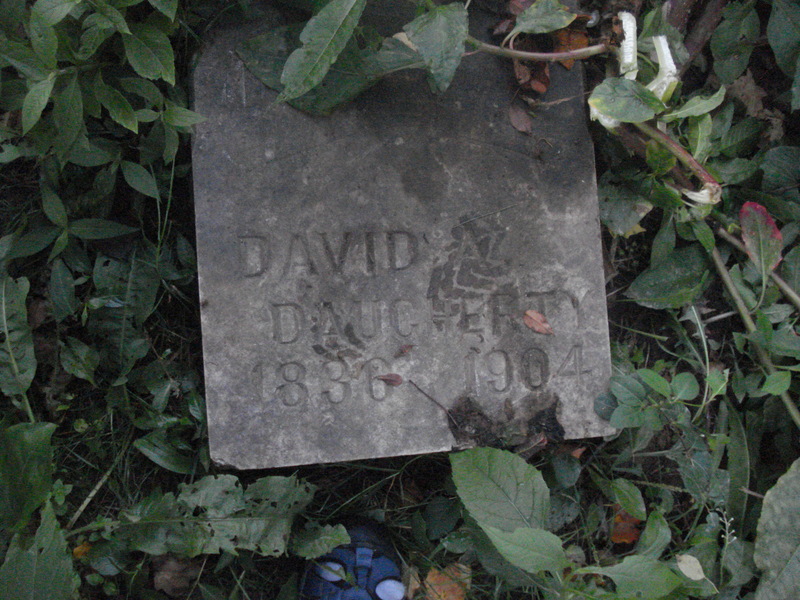 MJ & David had two other siblings, Isaac W. Daugherty (1828-1850) and George C. Daugherty (1829-1800). 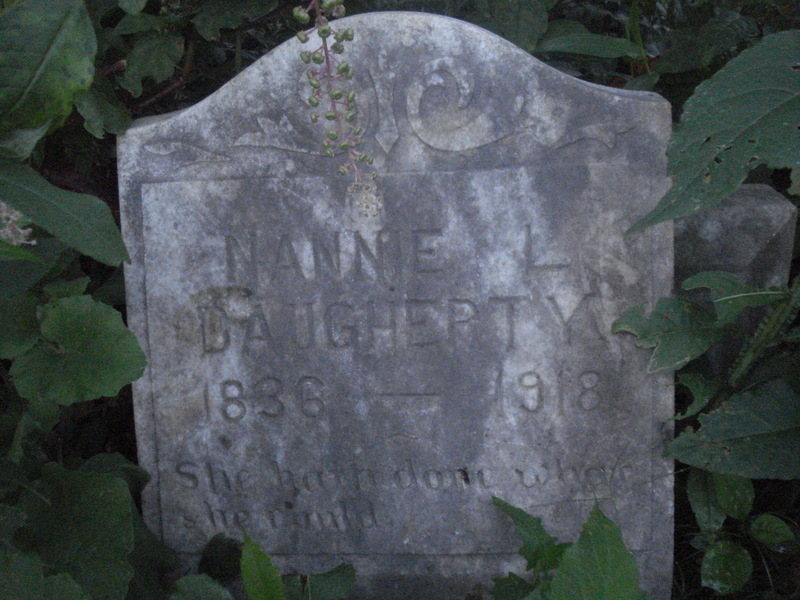 Mary Jane Daugherty married Daniel Parham Gregory on July 22, 1851. 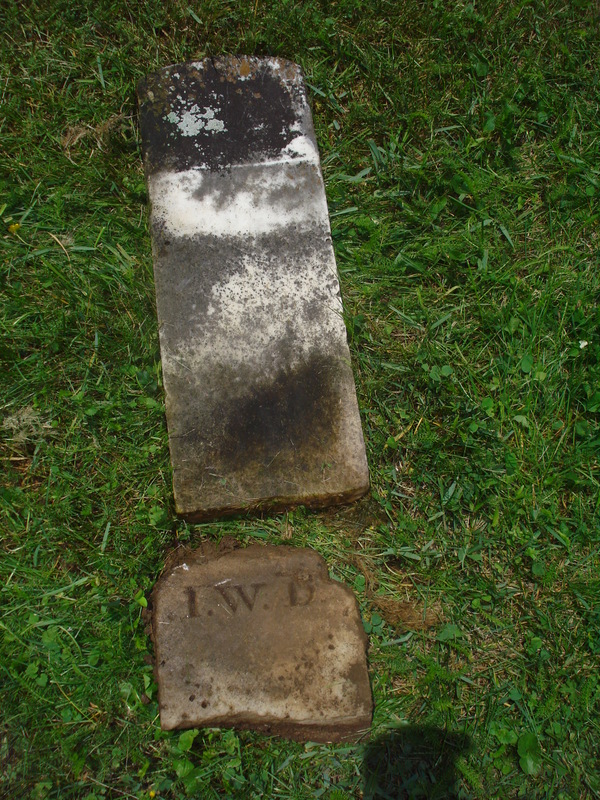 Nancy Ward (daughter of Virginia pioneer David Ward) married John L. Daugherty/Dougherty October 6, 1825. 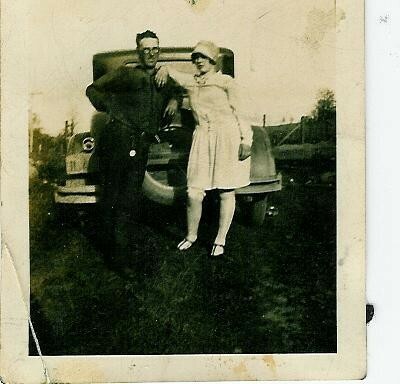 They are my 3rd great grandparents. 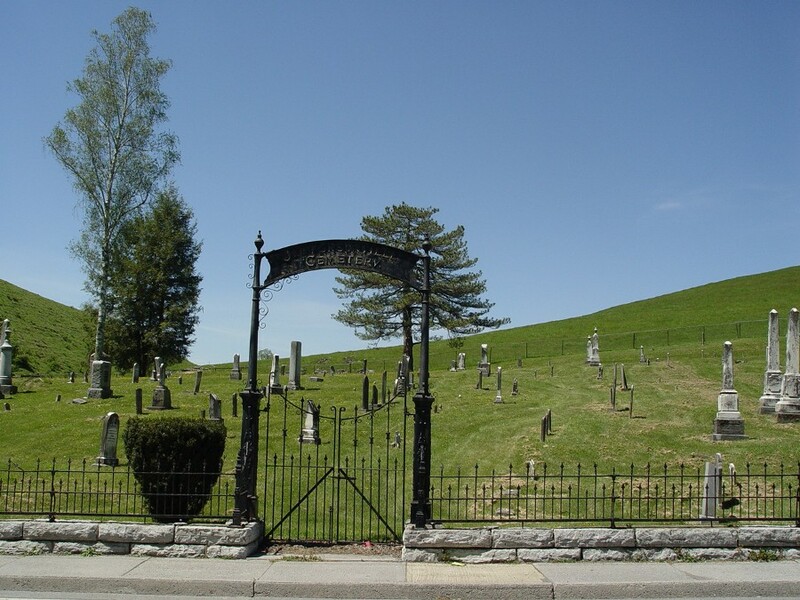 Isaac Daugherty is buried at the Jeffersonville Cemetery in Tazewell, Virginia. 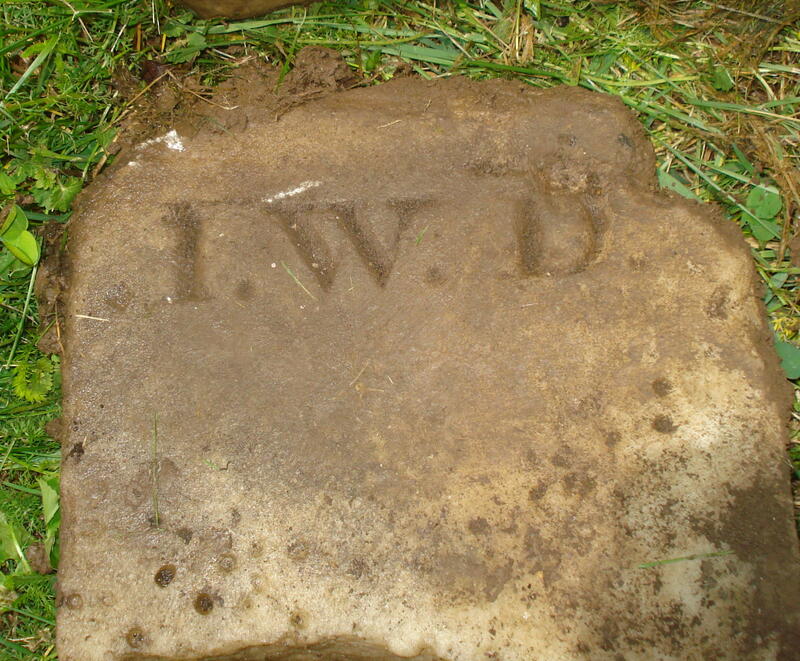 His headstone was broken and propped up against another, so the exact location is not known. 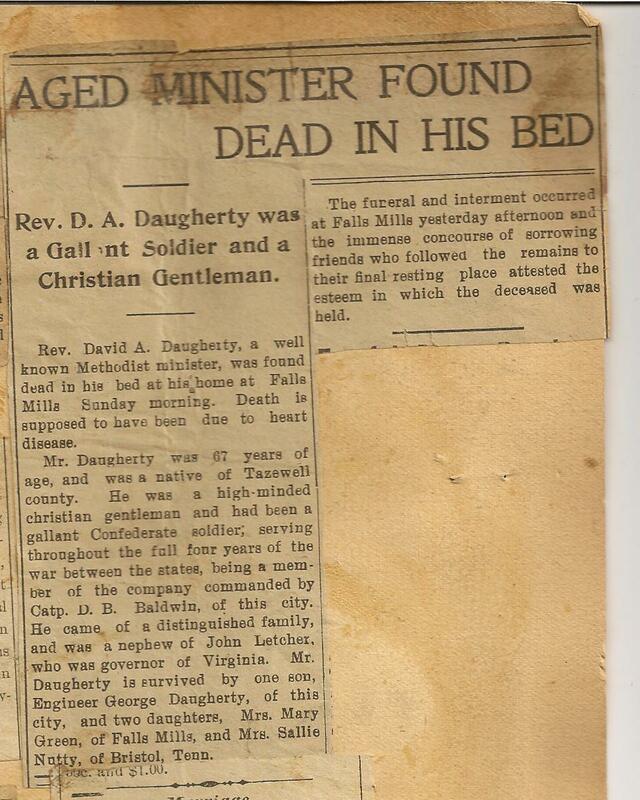 To date, I do not know more about brother George C. Daugherty.